Watercolorist Susan Weeks has had a mosaic of careers. From teaching in Guatemala, to being a law school librarian at UNM, to practicing law in Albuquerque, it is her current career as an artist that has enabled her to express what this lifetime of experiences has given her. Through her aesthetic lens, Weeks observes inner and outer worlds from which she takes her creative leaps. 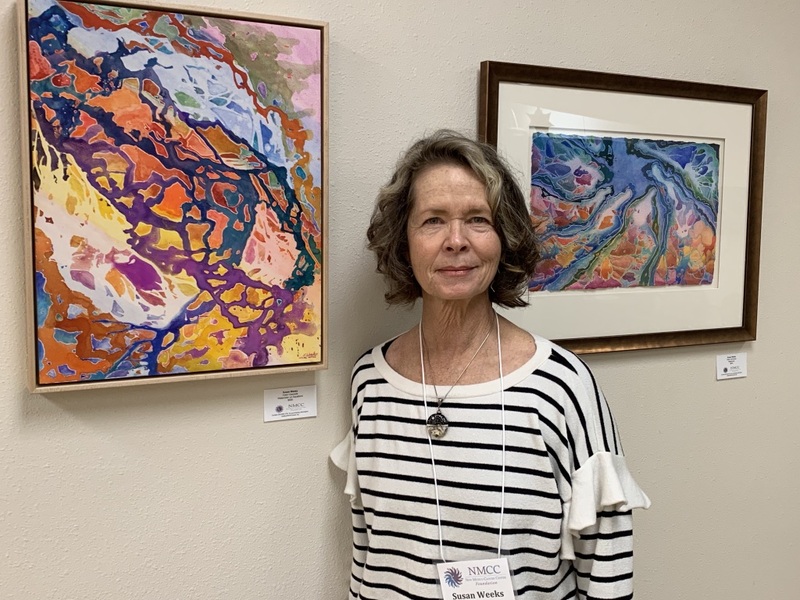 A self-taught artist, Weeks has continued to hone her craft with assistance from artists both around the world and locally. Her eyes were first opened to art during her year as a high school exchange student from Tennessee to the teeming, bustling city of São Paulo, Brazil. The Museu de Arte Moderna de São Paulo (MASP) was located blocks away from her exchange high school and to this day remains one of her favorite museums, with an impressionist collection rivaling any other. This first taste of other cultures and languages developed into an insatiable appetite, leading Weeks to major in Latin American Studies and to additional years living abroad in Portugal, Guatemala, and Germany. In each of these places, she furthered her artistic knowledge and skill with art courses. 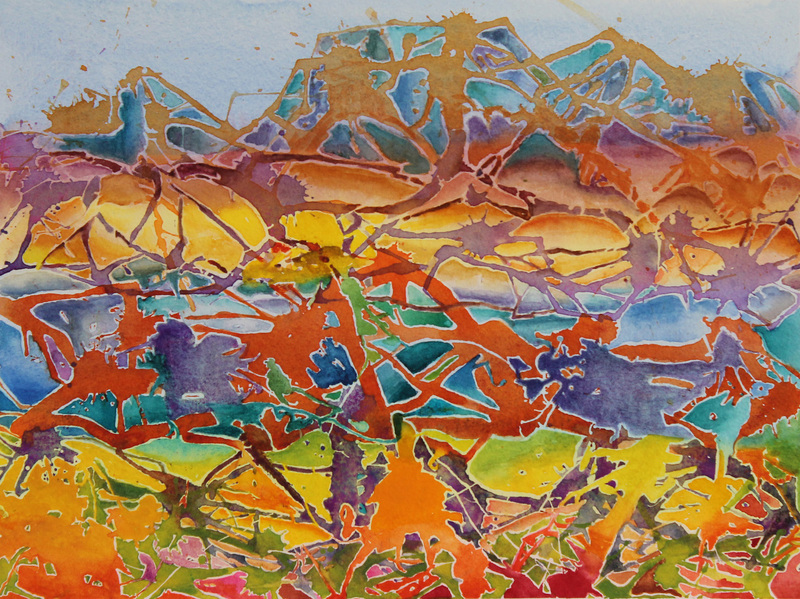 Weeks is a signature member of the New Mexico Watercolor Society and the Western Federation of Watercolor Societies. She is also a member of the Albuquerque/Santa Fe Urban Sketchers. She is represented by Patrician Design. For me, painting is therapy. During my time as an attorney representing children in abuse and neglect cases, I found myself spending more and more time painting in my free time. In contrast to the frustrations of my professional life, art provided an escape on a peaceful journey of playing with color and composition. I felt that while I lacked control in the outcome of my cases, I could control the strokes of the paintbrush and the creation of something beautiful. When I was unable to find the time to paint, I found I was significantly less happy than when I had painted, and I decided to dedicate myself full-time to art. When I first began making art, I would set up still lifes with fruit and flowers, but the flowers would wilt and the fruit would rot before I finished, needing to be replaced. I then learned to paint from photo references. I painted botanical subjects, reflections, and market series from my travels in a hyper-realistic fashion. Photography was the first step in my process. I would compose with the camera, and then crop down to what I felt was the essence of the subject; I liked to saturate my colors and deeply contrast the values. Then my mother had some health problems and I spent time with her, first in rehab and afterwards in assisted living. I started giving her watercolor lessons where we would paint a postcard-sized piece using contour drawings and experimental techniques that fascinated me, like splattering paint and blowing, using masking fluid in a similarly random fashion, and focusing on comforting subjects like clouds and trees. When my mother died, I grieved by continuing the postcard series as windowpanes on the painting, and then as larger pieces. I am currently showing this body of work at the New Mexico Cancer Center. Since I paint experimentally at a family cabin in the Cascade Mountains in eastern Washington State, some of my other paintings are abstractions of the landscapes I see while driving up to the cabin. In addition, I paint cactus (one of my favorite subjects) in a deconstructed and then reconstructed splatter and blow process. The creatures in space in this exhibition come from my fascination with the Hubble Telescope's photographs of the universe. Finally, for the past several years I have gravitated toward plein air painting because when I am in my studio facing the perennial question of what to paint next, I can just go outdoors and find plentiful paintable scenes all around me. “Corrales Grower's Market Bouquet” is the first of a series I painted for this year's Corrales' Garden Tour. These outings invigorate me, as do ones with the Albuquerque/Santa Fe Urban Sketchers. They force me to loosen up and simplify, and rediscover the joy of painting. Going back and forth in styles of painting keeps me learning, and allows me to connect with a wider audience.